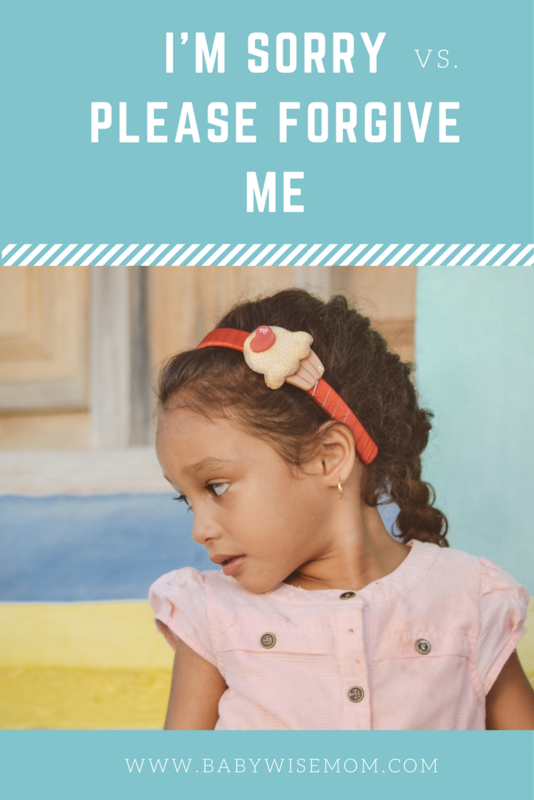 When I first read On Becoming Preschoolwise, my oldest child was still far from the age of being able to distinguish between I’m Sorry and Will You Forgive Me. However, I still took note of it and kept it at the forefront of my mind as a good practice. Can you see the value in this? Do you know people who don’t accept responsibility for their actions? My guess is you do. I think this is a very common problem in our modern day. There really are many people walking around the world who don’t think anything is their responsibility. Every so often, I enjoy watching Judge Judy. The show is just full of people who don’t think they need to be responsible for their own actions. There are also many people who don’t want to admit when they have done something wrong. We justify and justify our actions. As Preschoolwise points out, “Relationships work best when there is no unresolved conflict simmering within them” (page 162). Teaching your child to apologize will set your child up for healthy relationships in life. This teaches your child humility. People who ask for forgiveness “…show that the believe the relationship is worth the possible embarrassment often associated with admitting wrong” (page 162). We are talking real appologizing here. We aren’t talking, “Oh, I know I messed up so I had better help out around the house more.” We are talking you express that you are sorry for X action. But what about when it was an accident? What if you didn’t mean to hurt someone? Do you still need to apologize? Yes! You still caused harm in some way, and whether you intended to or not, you did it. It is like if you hit another car with your car. You can’t just say, “Oopps. I didn’t mean to do that” and have the police officer say, “Oh, in that case, no ticket” and the person you hit say, “Okay, then I will pay for the damage.” Any of you who have watched Judge Judy know that people actually use this as a legal defense. I didn’t mean to so I am not responsible. Like I said, when I first read about this idea, I thought it sounded interesting. Now that I have been able to put it into practice, I can tell you that it is very valuable. Even as a young four year old, Brayden would say, “But I didn’t mean to!” To this, I replied that I knew he hadn’t done it on purpose, but he had still done it and we need to apologize when we do something wrong. When the infraction was intentionally, asking forgiveness helps both parties. It creates a situation where the offender is at the mercy of the other person. It puts the offendee in a position to offer mercy and forgive. Saying, “yes, I forgive you” means you cannot harbor anger over the situation. You will be surprised at how much you will use this. You will also be surprised at how well your little preschooler can pick up on the subtleties of the language used here. You will be teaching him to admit when he is wrong and to work to correct his wrong actions. I am married to a man who is amazingly great at this. He is very humble and always apologetic. I can tell you that it is a great trait for a marriage relationship! What a great gift to give your child. What a great concept. I'm far from implementing, but I'll have to keep this one on hand when the time comes. My almost 3 year old is great at this…he even apologizes now without prompting. He bumped into me the other day and said, "Oh, sorry mommy. I didn't mean to do that." The problem I have is when he apologizes to a friend and the parents have not taught this concept. He cannot understand why the other child will not say, "I forgive you". Any thoughts? I should have known this was in the "wise" series… I'm so glad my parents taught me this concept – the words matter! It does wonders for my marriage and we will teach our daughter when she's older. Often when I ask for forgiveness my husband says, "I will always forgive you. "…to which I say, but I still have to ask. It is very humbling! I learned from a friend to have my kids say, "I'm sorry" and the other child says, "I forgive you." I never thought about having them ASK for forgiveness. This is actually difficult when you're in a home with kids who don't do this. My children have said, "I'm sorry," to kids who don't even acknowledge what they are saying. That's tough…most of the time they keep saying, "I'm sorry," until they respond. Sometimes I have to prompt the other child to at least say, "Ok." I wish all parents taught this to their children. I'm a member of the Yahoo group as well, and I just posted a question about how my son is constantly hitting, pushing, and yelling at his sister, so this post is right up my alley. What a perfect concept to start working on with my son. Perhaps the idea that it's not just about "sorry" will help him understand the consequences of his actions. Thank you! Megan D, thanks for sharing your experience! David and Melody,Situations like this are going to be common for the rest of his life. I still remember things roommates did in college that made me think, "Really? Didn't your mom teach you not to act like that? Mine did!" He will likely be around lots of kids who are taught at a lower standard from yours.So, I would just explain to him that not all children are taught the same way. Explain that we do the right thing no matter what others around us are doing. It will take him some time before he really gets that, but it is a great stepping stone and a great lesson for him to learn to do what he knows is right no matter who is or isn't around.Empathise wtih him (I know you want him to say I forgive you…) and explain (but he might not have been taught to say that). You could also teach him to say, "Do you forgive me?" That is a direct question, and most kids that age would probably answer. Thanks for sharing Katy! How neat. You are welcome mandgmom! I think you are right. I think this is a good concept to help with this situation! You are welcome! I think you will love this as it becomes part of your everyday language.